With all of this and more on the pro list, and nothing on the con I figured why not give it a try… but I didn’t really know where to start. What I did know is that Oprah wouldn’t steer me wrong, so in Spring of 2017 I signed up for Oprah and Deepak Chopra’s free 30 day online guided meditation. I was really excited about it for the first few weeks, it was awesome, Oprah would give the introduction to the mantra and Deepak would guide me through the meditation. Since I was so busy in the morning I started to meditate at night just before bed, but ultimately it didn’t last too long. Deepak’s soothing voice had me falling to sleep within minutes of pressing play, so even though I kept trying for a couple of months I finally just gave up. At the beginning of this year (2018) I figured let me try this again and decided to give it another try and add it to my daily self-care routine. I was invited to a meditation group challenge, where we would all meditate individually for 20 minutes a day for 30 days and hold each other accountable through a Facebook group. The timing could not have been more perfect and who doesn’t benefit from accountability, so I joined. It was difficult at first, making the time in the morning, but I set my alarm for 1/2 hr earlier and made it the first thing I did… after coffee of course. I decided not to use a guide this time, but instead created my own mantra and sat quietly repeating it to myself over and over, some days for the full 20 minutes and others just until I cleared my head. I had all of these questions like am I doing this right? Am I feeling anything? What am I supposed to be feeling? It was great to have a group of people to check in with and share our experiences, because what I learned is that there is no right or wrong way to meditate. Every day is going to bring up different thoughts and emotions, causing you to strengthen your mind in a new way each time. Having that group really helped me to successfully complete the 30 days. After that first month I was in a groove and have been continuing to meditate 20 minutes each day now for 6 months. There has been a noticeable difference in my life since the addition of mediation to my self- care routine. I am learning to become more present and focused in my thoughts. I have noticed changes in my overall stress level…little things that may have bothered me in the past just don’t seem so important anymore. I am becoming more productive with my time and letting go of people and things that are not serving me well has become easier. I am in a state of happiness more often than not, and seem to have more energy. Seeing these changes is wonderful and I am excited to see continued growth as my meditation practice deepens. I am no Guru, and totally understand that it’s difficult to start something new, especially if you are getting out of your comfort zone. 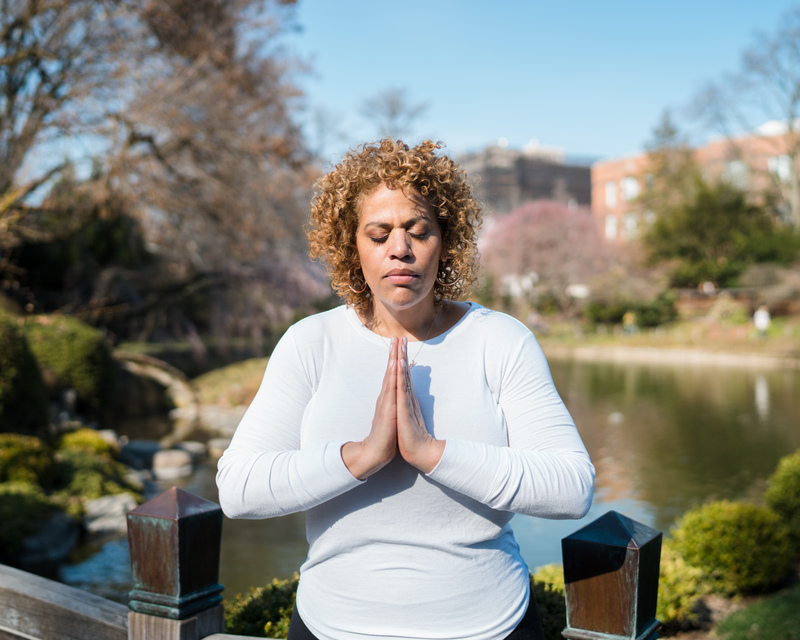 I want to share a few tips that I hope you will find helpful to get you started on your meditation practice so that you too can reap the benefits of meditation in your life. Make space for 20 minutes for yourself a day. You can break them up into 2- 10 min sessions, or 4- 5 min sessions, whatever works for you but 20 minutes a day overall is a good goal. Really commit and try it for at least 1 month. Get a small group of friends together and create your own challenge and check in with each other and share experiences. Start by making it the first thing you do in the morning… after your coffee of course. It’s hard enough to make the time, but once your day gets into full swing you will probably never find it. Set an alarm for yourself on your phone or another device so you are not tempted to look at the clock and put it on a low or relaxing tone, so you are not jolted when the time is up. Don’t worry how you are sitting or where, you can actually meditate anywhere. If you can, sit on a cushion crossed legged if that is comfortable and if not a chair of your sofa is just fine too… just find a place where you are comfortable and quiet. Once you start getting a routine down you can refine how and where you sit. Let go of judgment of yourself and know that there is no right or wrong way. Focus on your breath and let that start to guide you into a relaxed state, really listening to the inhale and the exhale, breathing deeply and fully. You may find it easier to use a guide and you can find many free online guided meditations with a simple google search. If you are doing non- guided choose a mantra that you can come back to when your mind wanders. I like to use “my life is filled with love and light”, or whatever you feel comfortable saying and keep repeating it in your head over and over until you come back to center. This is not about completely clearing your mind you are going to have thoughts, this is about creating a more peaceful mind so that you can live your life in a happier state.